Kentia palm trees (Howea forsteriana) are native to Lord Howe Island (east of Australia), and are known for their graceful arching fronds. Howea forsteriana (also known as Sentry Palm) belongs to the Arecaceae family, and can be planted year round in USDA hardiness zones 9B through 11. Kentia palms reach an average height of fifteen to twenty-five feet tall, with a spread of three to five feet wide when grown outdoors. When grown indoors, average height is typically five to twelve feet tall. The thin trunk resembles bamboo and has a six inch diameter. 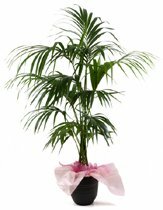 The arching dark green palm fronds have a sleek, smooth appearance. The evergreen leaflets are 12 to 18 inches in length. These palm trees are versatile, and can be grown indoors as house plants, planted outdoors as a border or focal point, or planted in groups to screen off an area in the garden or landscape. Kentia palm trees are the perfect indoor palm to accent an entryway, or display in an elegant room of the house that receives bright, indirect light. They are easy to grow indoors, and thrive with minimal care. Lighting - Choose a location that receives bright, indirect light. Although Kentias will tolerate low-light conditions, the palm may only produce 4 to 6 fronds (as apposed to twice the amount). Temperature– The ideal daytime temperature ranges from 65°-75° F. Evening temperature should not fall below 55° F. Keep palm away from hot or cold drafts. Humidity – Kentia palm trees require moderate to high humidity. To provide adequate humidity, spray palms with water several times a week, or place plant container on a saucer filled with pebbles and water (water should be just below the pebble level). You might consider placing a room humidifier near the plant. Soil & Fertilizer – You can use a regular potting soil with coarse sand or peat added into the mix. During growing period, fertilize every one to three months with a liquid fertilizer diluted to ½ strength and mixed into water. Do not fertilize during slow growing periods (Fall & Winter months). Watering – Sentry palms require moderate watering. Keep soil evenly moist during growing period (spring through fall); slightly dry through the winter months. The best time to water this plant is when soil becomes dry to a depth one inch down from the surface. Kentia palms thrive in tropical climates, and can be planted year round in hardiness zones 9B-11. They can be planted outdoors in a container or above-ground planter, as well as in the garden or landscape. Be sure you choose a shady, low-light location. Fertilize once a year during the growing period with a slow-release fertilizer. Keep soil evenly moist during the growing period. During winter, water when top one to two inches of soil is dry. Do not plant this palm in a dry location. Kentia palms like moderate to high humidity. Brown tipped palm fronds are a sign of dry air or under watering.